You had the hangover breakfast yesterday (bacon egg and cheese sandwich, chocolate milk, the works) and now it’s time to detox from all the weekend’s not-so-healthy consumption of beer and 2 a.m. pizza. Detoxing for me includes good food (fruits, veggies and protein), a tough workout, then bed early. 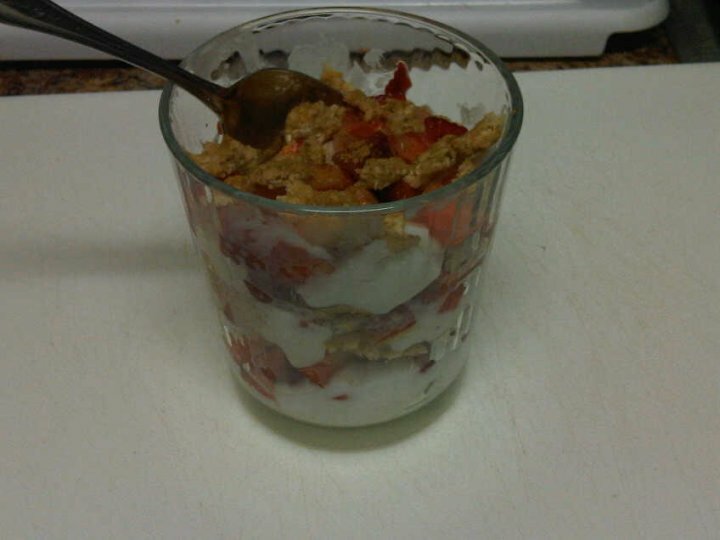 The best way to start detox day is a nutritious breakfast, and here’s my favorite fix: a yogurt and fruit parfait. This recipe is very flexible; plus it works for breakfast, a snack, or even a healthy dessert. It’s low budget and extremely easy, so check out the recipe below and start detoxing! 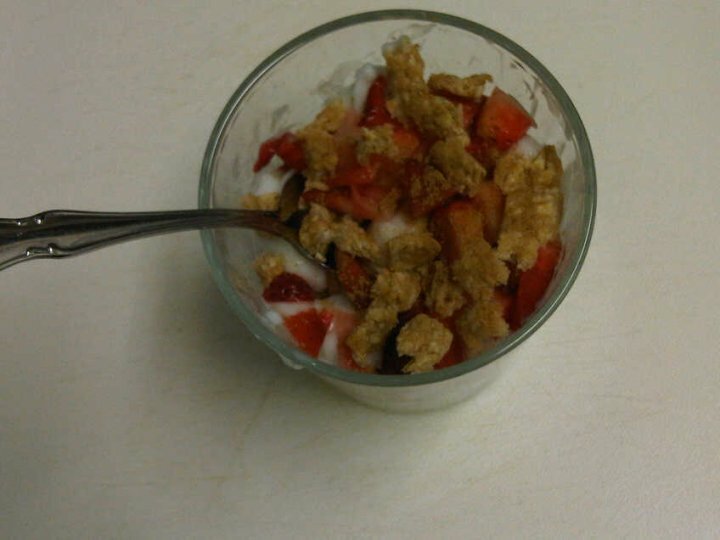 Yogurt: I buy them by the small containers at the grocery store for a variety, and they’re really cheap (Around $0.50!) 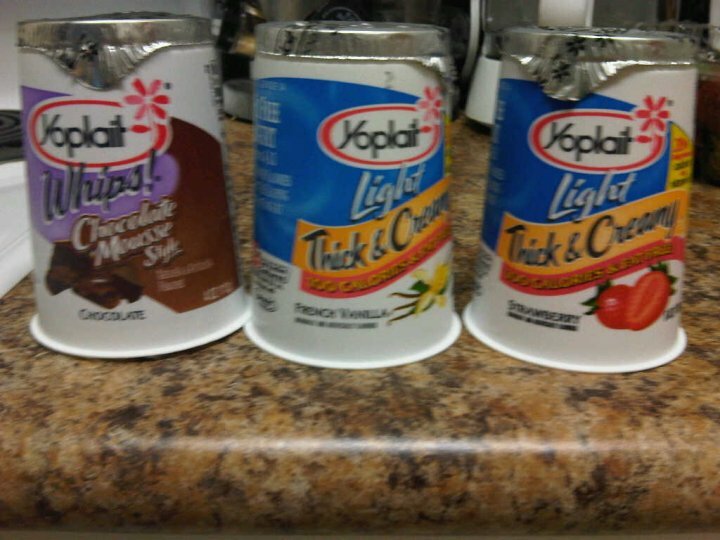 My favorite brand is Yoplait low-fat thick and creamy, or the Yoplait Whips work good too. They have a ton of different flavors, and my favorite for this parfait is french vanilla. You can also buy large tubs of yogurt, too. Fruit: I used strawberries today (4 of them), but in the summer blueberries and raspberries are good options. Blackberries and bananas are also great choices. Feel free to use multiple fruits too! Granola: I buy boxes of granola bars (around $2 for a box of 8; any flavor with oats and honey works best) then cut them up since it’s a quick alternative to making my own. But if you want to try making your own, check out this recipe from The Food Network’s Alton Brown. Just be careful not to burn it! 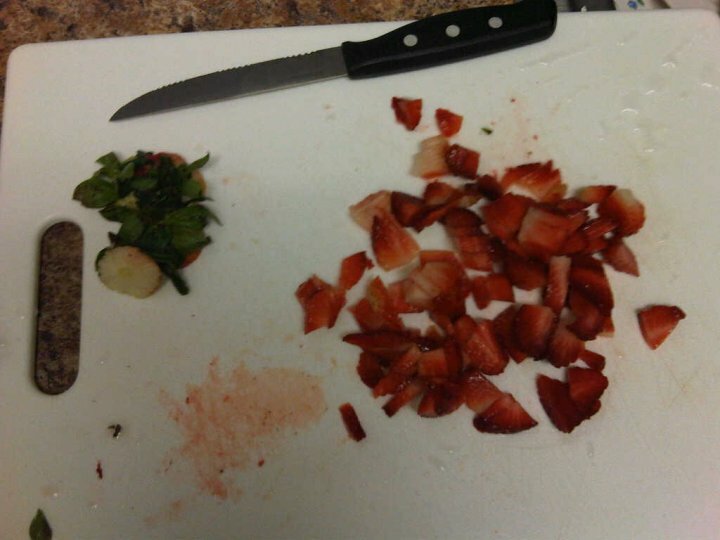 Chop up the fruit you’re using if it has to be chopped (strawberries, bananas) into very small pieces: see the picture below. Cut the granola bar into small pieces. It’s a little tough to cut, since the bars are usually sticky. In a glass cup (seeing the layers through the side looks pretty 🙂 plus it helps in measuring), add the first layer of yogurt. Each layer of yogurt should be about 3/4 of an inch, but it’s not really that important how tall the layers are, just as long as you use all of the ingredients and the layer are somewhat even. On top of the yogurt, add the fruit: this layer will be shorter than the yogurt since you probably have less of it; it should around 1/2 inch. 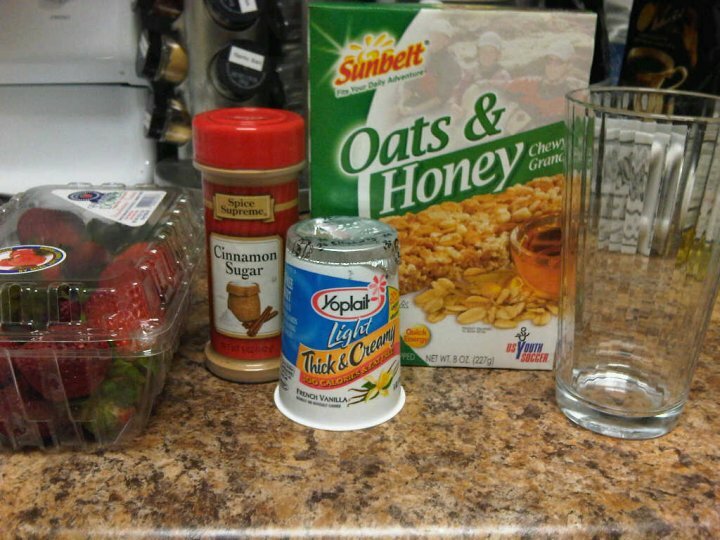 On top of the fruit, add the chopped granola. You don’t need to cover all the fruit with the granola, too much is overpowering. Sprinkle cinnamon powder over all three layers; again, not too much. When you’re eating the parfait, you’ll want to stir the layers around so the cinnamon gets spread out. Repeat steps 3-6 until you’re out of ingredients and the glass is full. I usually use a medium size glass (see the picture) for a personal serving. But if you’re really hungry or serving people for a full breakfast, feel free to use a taller glass. For a special touch (when serving others), add a fresh mint leaf for decoration on top. And there you have your Monday detox breakfast (or breakfast any day for that matter). Almost too easy, right? Enjoy! Search for your favorite recipes!